THERE'S BEEN A WHOLE LOT OF PREACHIN' GOIN' ON! "The Primary Duty of the Priest is to Preach." On June 13, I gave my 700th and final homily at Bellarmine University as the Director of Catholic Worship. I thought it might be a good thing to review just a few of the preaching occasions I have had during the last 48 years. By the way, I still have about 90% of all the homilies I have written over the last 40 years in hard copy and many of them on tape and published in books and columns. 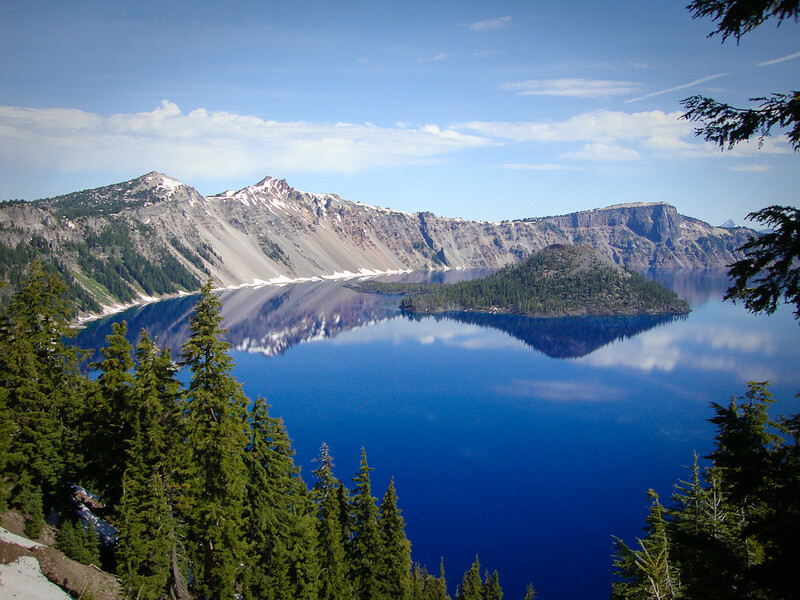 I actually started preaching in the campgrounds of Crater Lake National Park (Oregon) in the summer of 1968 in a United Church of Christ program for student ministers called A Christian Ministry in the National Parks. I was the first Catholic to sign up for this program. I preached generic Christian sermons twice each weekend that summer. Besides preaching, I was a desk clerk, bar tender, wine steward, garbage truck driver and Master of Ceremonies for the "Miss Crater Lake Beauty Contest." I have always thought it interesting that the United Church of Christ gave me an opportunity to preach long before I was given that opportunity in my own church. I have conducted over 75 Parish Missions over the last 30 years. This is the poster for my upcoming Parish Mission for all the parishes of Meade County combined. I am really looking forward to this one! Preaching at St. John Church, in the town of Mesopotamia, in the island country of SVG. Preaching to young Protestant preachers at Louisville Presbyterian Seminary. 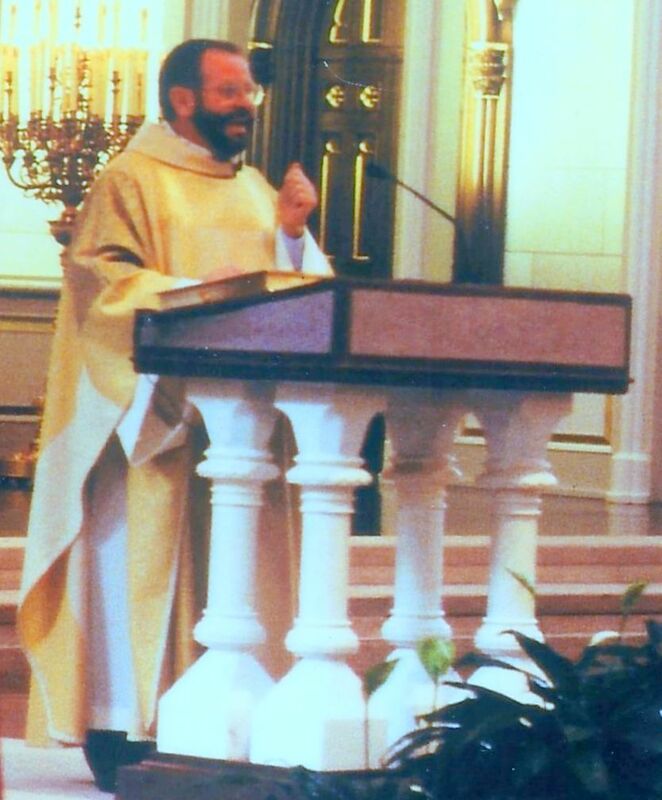 Preaching at Bellarmine University almost every Sunday for the last seventeen years. Preaching at a Sunday Mass in the island country of SVG. 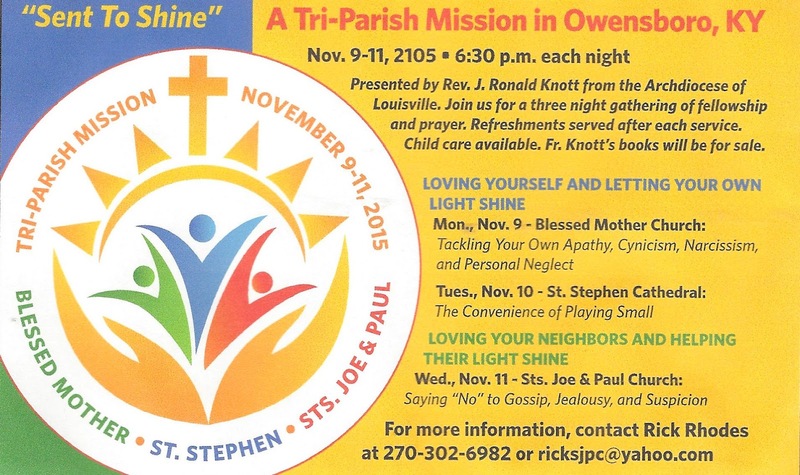 Preaching a Parish Mission in St. Stephen Cathedral in Owensboro, Kentucky. Preaching to the Diocesan Staff in Victoria, Canada. Preaching to the priests of Regina, Canada. Preaching a three-parish Parish Mission in Owensboro, Kentucky. 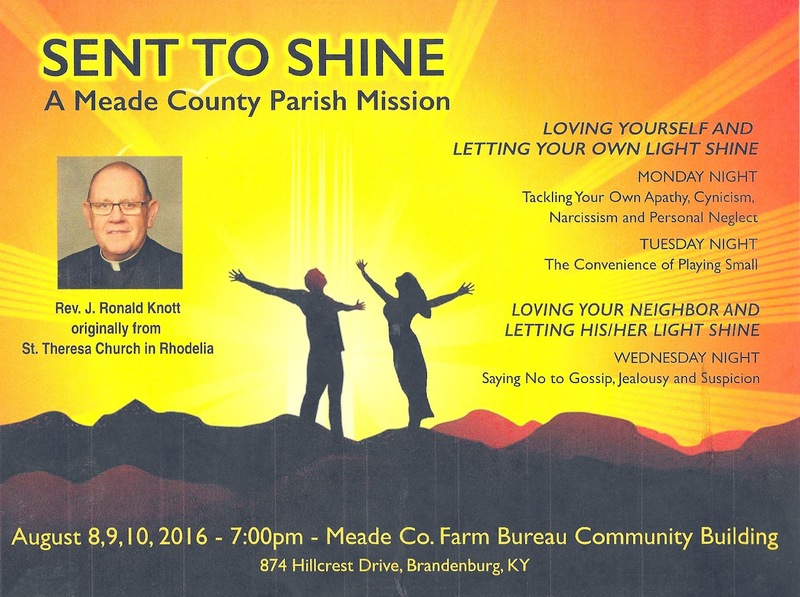 Region III Parish Mission, Louisville, Kentucky. Preaching at the Cathedral of the Assumption in Louisville for 14 years. 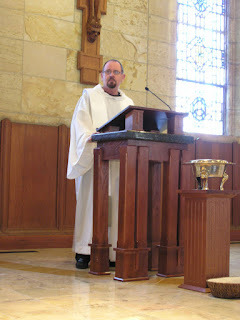 Preaching in the chapel at St. Meinrad Seminary for ten years. Since preaching is "the primary duty of the priest," I want to be buried with a Lectionary in my hands. The Lectionary, of course, is that book of Scriptures used by the lector, deacon and priest at Mass. This is the Lectionary presented to me by Archbishop James Weisgerber of Winnipeg, Canada, for my casket after I talked about it in one of my presentations during their priest convocation in May of 2010. 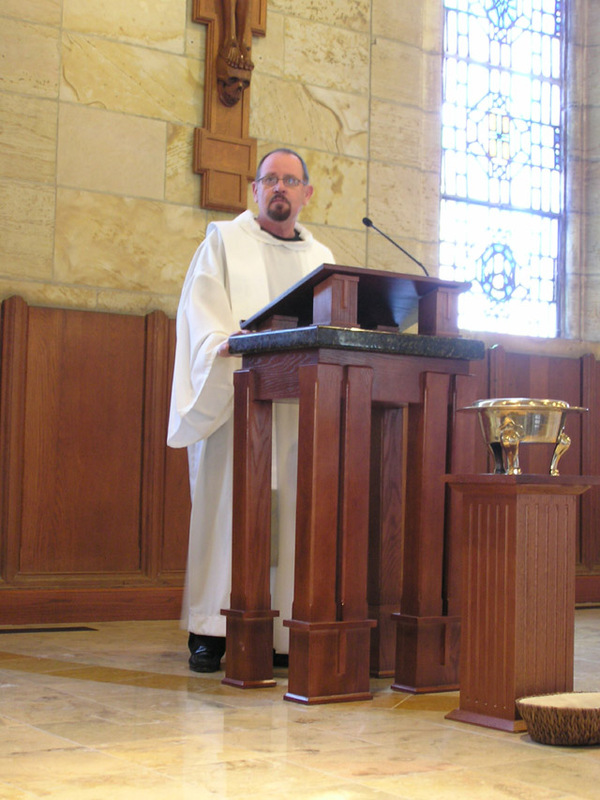 These two photos were taken by Mark Thompson Sunday, June 6, 2016, as I was giving my final homily as chaplain in Our Lady of the Woods Chapel at Bellarmine University at the Alumni Mass. I may be invited back as a guest or to fill in, but this was the last preaching event as an official chaplain after being the longest serving chaplain in Bellarmine's history - seventeen years. Assisting me were Father Michael Wimsatt (a graduate of Bellarmine) and Ms. Melanie Prejean Sullivan (Director of Campus Ministry) with whom I have worked for almost seventeen years. Don’t let this Roman collar fool you! I knew when I put it on this morning that I could be the target of some serious stereotyping even before I opened my mouth. I am used to it. At one of the receptions following my ordination, an angry young woman confronted me in front of a circle of friends. “How long did you go to school for that,” she hissed, pointing to my collar. When I answered her, “twenty years counting grade school,” she responded, “My God, you could have been something!” I suppose she meant a doctor or lawyer, but obviously she could not imagine anyone in their right mind choosing priesthood. As a very young priest, I was kicked out of a ministerial association meeting being held in a local church, down in the southern part of the state, when I showed up in it for my first meeting. The host minister left the room when I entered and sent a note back in by his secretary that read, “I can no longer in conscience be part of this group now that it has a Catholic in it! Please leave my church!” During the worst days of the sexual abuse scandal, I caught myself, one day, putting my hand over it at a stop light here in Louisville. It takes a lot of courage to wear a Roman collar these days, so I ask you to lay aside any prejudices or already arrived at conclusions and keep an open mind. I am a Catholic priest, yes, and very happy being one for over 46 years, but that is not all I am. I like to put it this way. I am consciously Christian, deliberately Catholic and unapologetically ecumenical and interfaith in my approach to life. I have a bachelor’s degree and a master’s degree from a Catholic seminary and doctorate from a Presbyterian Seminary. My spiritual adviser in the last Catholic seminary I attended was a Disciple of Christ minister. As a Catholic seminarian, I worked as a campground minister in Crater Lake National Park for the United Church of Christ. I was a major part of founding two interfaith organizations: an interfaith campus ministry program at Somerset Community College called IF and the Cathedral Heritage Foundation (now called the Center for Interfaith Relations) when I was pastor of the Cathedral of the Assumption on Fifth Street. I have attended a bar mitzvah at The Temple, prayed at the mosque on River Road and meditated at a Quaker meeting in Berea. I have taken students of various faith traditions (and none at all) on five trips to the ecumenical monastery in Taize, France. That unique monastery is made up mostly of Protestant monks and only a few Catholic and Orthodox members.) I have close friends who are agnostic and atheist. I am comfortable relating to millionaires and street people – often in the same day. I have preached in Baptist, Presbyterian and Lutheran churches. I have been honored by the National Conference of Christians and Jews. I admire people as diverse as Rev. Kevin Cosby, Chrisy Brown, Muhammad Ali, the husband and wife Rabbis Raport at The Temple, Jerry Abramson, The Dalai Lama and Pope Francis. My ideas attracted a $2 million grant from the Lilly Foundation to study and address the issues facing priests in their first five years of ministry. 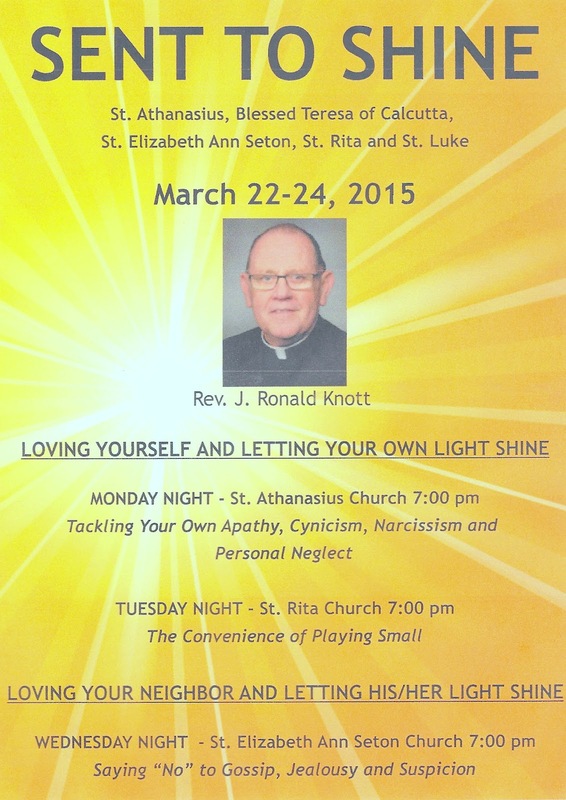 Part of the grant enabled me to start a program to help international priests acclimate to American culture. As a result, I have been able to meet and interact with hundreds of these men from over twenty countries. I know people from all over the world and interact with them almost every week. I am proud that I can do all that - be a firmly committed Catholic and be at the top of my game as an effective priest at 72 years of age. I do it because I work at it. I love having all this variety in my life. I have always believed that those who agree with us bring us comfort, but those who disagree with us bring us growth. All this variety in life has expanded my mind. I have a high tolerance for different perspectives, but I have no tolerance for bigots, meanness, cruelty, laziness and whining. Whiny priests, especially, get on my nerves. As I tell my fellow priests and their bishops when I have spoken to them in a hundred dioceses in nine countries over the last several years: “If you are happy, speak up! If you are not happy, find a way to get happy! If you can’t find a way to get happy, then do the rest of us a favor and shut up!” (You have to blunt with priests to get their attention.) I haven’t been shot yet so I will probably keep doing it! One of the quotes that guides me in all this is one from George Bernard Shaw. "This is the true joy in life...the being a force of nature instead of a feverish selfish clod of ailments and grievances complaining that the world will not devote itself to making you happy." I was born at home, on April 28, 1944, in a very small, very rural town, along the Ohio an hour down-river from Louisville, in Meade County. Almost dead on arrival, I was delivered by my country midwife grandmother. As a result, I have been fighting for life from day one! I next went to the Benedictine run St. Meinrad Seminary over in Indiana just north of Tell City. My experience of the St. Meinrad approach to seminary formation was, “We know you have gifts and talents and we will keep digging till we find them and help you make them grow!” When I arrived there in 1964, their approach scared me even more than the St. Thomas Seminary approach because I thought if they were to dig, they would find out that I didn’t have any talents! I responded by trying to become invisible. On that fire escape that day, I decided to take charge of my own happiness and quit blaming other people for the way I experienced life. Realizing there was no rescue party out looking for me, I decided to quit waiting to be rescued. I decided, to paraphrase the words of George Bernard Shaw, “to be a force of nature, rather than a feverish little clod of grievances and ailments, always complaining that the world will not get together and make me happy.” I decided to quit playing the blame game and make myself happy, no matter what pastoral assignment I got, no matter who the bishop was, no matter what ideological direction the church or country took! I started with baby steps and moved deliberately and courageously toward bigger and bigger steps. The rest is history. I have been working my program ever since and I am still working it today! I plan to keep working it till God calls me home! Thanks to that "fire escape decision" I am still making the decision daily to live deliberately, consciously and on purpose. I have soared beyond my wildest imaginations! I went from being too bashful to read in front of my classmates to being an international public speaker! Because of that "fire escape" decision, I have been the featured speaker in over 100 week-long programs in 9 countries. Because of time, I have so far turned down speaking engagements in Singapore, India, Tonga and Nigeria. Because of that "fire escape" decision, I have gone from crippling self-doubt to being honored as a recognized leader in my profession. I have learned that indeed change is inevitable, but growth intentional. The opposite of intentional growth is “spiritual suicide.” I would define “spiritual suicide” as the result of always saying “no” to opportunities to change, to grow and to learn. I have learned that to live deliberately, consciously and on purpose, one has to stand up to one’s own laziness and cowardice and make a passionate commitment to personal and vocational excellence – to who one is and what one does! We have to stand up to those discounting voices inside our own heads, as well as those coming out of the mouths of the people around us. The latest manifestation is the decision to take charge of my own retirement rather than leave it up to my diocese to take care of it for me. Actually I have been taking charge of my retirement since ordination. For one thing, I wanted to own my own home by the time I retired so I started saving for it back in 1970. That is only one of many of my goals set years ago that have been met! I want retirement to be about “re-inventing myself.” I want to keep on living deliberately, consciously and on purpose. I do not want to continue hanging on to the stuff that I have always done – but just turning down the dial a bit. I want to keep serving in a new way with a renewed passion. I want to pick and choose what I want to do, but I still want to do! I want to be personally interested and interesting. I want to burn out, not rust out! Yes, I want to live what’s left of my life, deliberately, consciously and on purpose – just as I made up my mind to do, that day on the fire escape, back in college. So far, I am as busy as ever, but I have the luxury now of saying “yes” or saying “no.” I haven’t even waited around to be asked if I want to do this or that! I created my own plan and an organization to carry it out. I still write a weekly column for our diocesan paper. The Record, because I still enjoy it after fourteen years of doing it weekly. I am committed into 2018 to lead priests retreats in the United States, Canada and a few other countries because I am still being invited, because it is extremely interesting and because I can make some good money doing it to fund my new organization for retired people like myself. I am now volunteering down in the Caribbean, most especially the poor country of St. Vincent and the Grenadines, off the coast of Venezuela. I have made four trips already and I have two more on the calendar this fall. “Second wind” is a phenomenon in distance running whereby an athlete who is too out of breath and too tired to continue, suddenly finds the strength to press on at top performance. Traditionally, a “guild” was a group of professional artisans and craftsmen engaged in the same occupation who would associate themselves together for protection, mutual aid and service. These guilds performed other services for their members as well as the community at large. Fundamentally, the Second Wind Guild is different from those typical volunteer organizations who take youth to places like that to paint and fix up individual homes. It is more of a clearing house for teams of retired professionals who want to use their talent, connections and resources to strengthen the lives of people down there by strengthening existing service organizations and targeting specific projects. (Volunteering in a warm climate in the winter doesn’t hurt either.) The first team of retired professionals is gradually coming together for a possible trip down in September. Our first project is to renovate the pastoral center in Kingstown so that it will be a comfortable and clean place out of which these teams of retired professionals can operate. So far we have three professional couples, one single and myself. I am still looking for professionals from the corporate world of kitchen equipment and furniture to complete the team. If any of you would like to learn more, or have any connections along these lines, please contact me. What I have tried to say today is this, change is inevitable, but growth has to be intentional. There are a lot of things we can’t control, but there are still a lot of things we can. We can be one of those people who believe that life is something that happens to them or we can be one of those people who is a “force of nature,” as Shaw called them. We can be one of those people who choose to live deliberately, consciously and on purpose – not only when we are young and starting out, but also when we go into retirement. Even in sickness and times of great loss, we can still choose our response to life’s challenges. One of my heroes, Victor Frankl who survived the Nazi prison system, noted this basic truth. “The last of the human freedoms is the ability to choose one’s response to any given situation.” In retirement, I choose to keep serving other people over pampering myself. I don’t know how I got invited today or why, but I am honored to be here. However, I don’t believe it is an accident that I am here today. It is serendipitous that your purpose of bringing together business and professional leaders in order to provide humanitarian services, encourage high ethical standards in all vocations, and to advance goodwill and peace around the world dovetails with my mission in retirement. Your mottoes of "Service above self" and "One profits most who serves best" resonates deep within my own heart. Thank you! All these people heard my speech! Incredible! That's me - center left! Looking for a very generous donor and prayerful people who believe in miracles. I am hoping to establish my headquarters for my new program for retired priests and professional lay people who might be interested in using their skills, connections and resources to strengthen the outreach ministry of the Diocese of Kingstown in the island country of St. Vincent and the Grenadines. Below is an artist rendition of the remodeling of a present space within the diocesan centre: entrance, bedroom/office and bathroom. The plumbing system, electrical system, air conditioning, windows, flooring, lighting and window treatments need a complete overhaul. There is a need for new furniture, a computer and a secure storage area. I would use it when I am down there as a headquarters for the Catholic Second Wind Guild and it would be used as the bishop's guest room when I am gone. The emphasis is on simple, clean and workable. Renovated Entrance to SECOND WIND GUILD Headquarters. Lockable Office Space Next to the Closet. As I prepare my fourteenth volume of columns from The Record, our diocesan weekly here in Louisville, I am reminded of two people in particular. The first is Mrs. Jeanne Paradis who helped me publish my first book and Mr. Joe Duerr who gave me an opportunity to write a column. I am amazed at what a little encouragement can do! It is because of their encouragement, I am able to offer an encouraging word to so many Catholics each week. It is because of them that I chose to call my column "An Encouraging Word." Simon, you did not offer me the traditional gesture of hospitality - water to wash my feet. She has bathed my feet with her tears and has not ceased kissing my feet since I got here. The gospel of Luke is my very favorite because it is the gospel which most presents marginalized people as heroes - women, children, the unchurched and the diseased. It is the gospel of the despised, rejected, discounted and the left out. It is the gospel, I believe, that most inspires Pope Francis. It's all about mercy and forgiveness, all about going to the margins, all about God's unconditional love for all people. All kinds of messed up stuff is going on in this story. The whole thing would have freaked out any upstanding synagogue-going religious observer. People would expect good people to put up a wall between themselves and bad people to protect themselves from contagion, but in this story Jesus once again tears down those walls and embraces those walled out! He not only does it, but shows us that God does the same thing. This story has to be one of the most shocking stories in all of the gospels. First of all, a Pharisee invited Jesus to dinner. In the first place, that would have been a nervy thing for a Pharisee, a meticulous religious rule keeper, to do because Jesus and the Pharisees were on a collision course over Jesus and his routine of not observing many of their sacred religious customs - and teaching others to do the same. To the establishment, Jesus was a religious pariah. What would have been Simon the Pharisee's motive for his invitation? It certainly wasn't out of respect and love because he disrespects Jesus by failing to offer him the customary water to wash his feet that any guest in a Jewish home would have offered. Maybe he was a "collector of famous people" who wanted to be admired by the community for his ability to snag such a controversial guest as entertainment of the other guests. Maybe he knew that it had the making of one exciting party - with fireworks to boot! Second, what was Jesus' motive for accepting such an invitation? Certainly, it was an opportunity model his love for all people, even the religious establishment. Did he not say, "I did not come to destroy the Law, but to fulfill it?" Certainly, he knew that it would probably be an occasion to teach the religious establishment about God's love for all human beings, even the despised, rejected and left out. News travels fast! A woman, known for her sinfulness in the community, hears about this dinner party and crashes the party. As Bob Dylan used to sing, "Freedom is just another words for nothing left to lose." She makes a scene. She shocks the guests and freaks out the host. She gushes with shocking, illegal, enthusiastic gestures of love. Women were meant to be scene, but not heard! She walks right into the room of men, gets down on the floor, lets down her hair, cries profusely all over his feet instead of pouring water over them, dries them, not with a towel, but with her hair, opens up a bottle of expensive perfumed oil and anoints them. A decent woman back then would never have crashed a men's group, never have touched another man other than her husband, never have let her hair down in public. With this, the theological fireworks that Simon had, no doubt hoped for, broke out! Surely, Simon the Pharisee knew that his golden moment had come - that his party would be talked about for years to come! Surely, Jesus knew that his golden moment had come - to teach people about God's unconditional love. The story ends with the woman being grateful and the Pharisees critical. The woman was extravagant with her love. The Pharisees were stingy with theirs. This dramatic story ends with Jesus delivering his pithy, yet profound, teaching, "Little is forgiven the one whose love is small!" One of the biggest challenges I have faced as a priest is to convince people of God’s unconditional love for them. Why is it that so many of us have been trained by people who have dismissed these intimate stories of God’s love and have combed through the Scriptures, piecing together condemning, judging, and damning messages that they turn into a religion? Why did they, and why do we, find those negative messages more believable? I have received more letters questioning my “too lenient notions of God’s love” than any other critical letters since I became a priest. Jesus revealed the “true God,” not this “false mean god” that people have created since Adam and Eve. Even in that story, God says to Adam and Eve, “Who told you that you were naked?” (Genesis 3:11). In other words, “Who told you that you were bad, separated from me, and defective? I certainly didn’t!” Jesus came to talk us out of the mean God we keep creating in our own minds. I can’t imagine trying to live my religion without being in love with God! I can’t imagine practicing a religion based on fear and dread! This is what I believe and what I have tried to teach as a priest for the last forty-six years! At the end of the day, when all is said and done, when all the religious laws are boiled down, it comes to this, "Little is forgiven the one whose love is small!" MAY THEY BOTH REST IN PEACE! MAY THE SURVIVORS BE RESTORED TO HEALTH! Last week was a very sad week on the island of St. Vincent because three parishioners of St. John's in Mesopotamia were involved in a car fire. Two sisters and one of the sister's six year old grandson were badly burned. Ms. Lulu has succumbed to her injuries. This is a photo of Ms. Lulu (who passed away from her burns) giving the sign of peace to Bishop County during Mass at St. John's Church in Mesopotamia. The other sister, Ms. Cornelia Quashie, was flown out Thursday to the Burn Unit in the island country of Martinique, Ms. Cornelia's heart kept stopping before they could stabilize her for the flight.The six year old grandson, Johani, was released from the hospital, thank God! It has been a sad week down there on another front. Mrs. Daphne Paynter's (Bishop County's secretary) sister, Alice, also passed away this week. Please pray for all of them!